You're cherishing the moment, smiling at your child. They are seriously the most precious thing in the world. You watch them as they sleep, as they eat, as they learn to drink from a cup, as they become more efficient and effective and capable. There's that one moment where your smile turns to panic and you watch the cup fall from your child's hands... headed directly for your brand new carpet. You become a professional volleyball player, leaping through the air to catch the cup, and - you fail. You watch as their red juice lands all over your floor. Or, let's be honest. 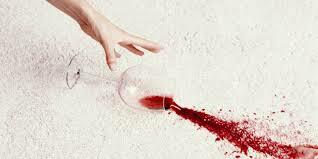 That glass of wine slipped from your hand as you were telling a story and that white carpet now has a distinctly different hue! The good news is, we can save the situation. Act fast, blot up all the extra juice, then - magic. Combine one tablespoon of liquid laundry detergent and one and one-half tablespoons of distilled white vinegar and two cups of water. Work the mixture into the carpet stain, then blot dry. You may need to scrub the spot well, rinse, and reapply the solution based on the severity of the stain. Speaking of artwork designs on the floor, what happens when your child find those crayons or markers and creates a masterpiece on your freshly painted wall? As cute as it may be, it's probably not something you want to save for years to come. Try these tips on a small part of your wall before handling the entire project! Crayon Marks - Use a baby wipe or ammonia-based window cleaner. Magic Marker - Try rubbing alcohol on a cotton ball/wipe. Ballpoint Pen - Spray hairspray directly on the spot and use a soft rag to wipe clean. And make sure to give your child a hug for their beautiful creation, while providing them with a roll of paper they can use to draw more, or an easel to stimulate and encourage the budding artist to be!